With summer in full swing, July is the natural fit for National Grilling Month. Grilling is all about good times, good friends and great food. 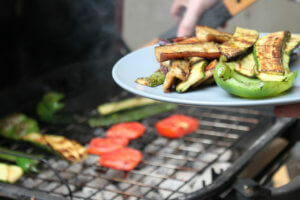 Keep grill away from house, – experts say that the grill should be kept at least ten feet from your dwelling, and should be free from debris or decorations. Check for gas leaks – gas leaks can cause injury and a hazard to safety, ensure that the gas line is free from leaks and properly attached to the gas tank. Preheat grill to kill any bacteria that may be present on the grate – with the lid open, turn on the grill and ignite the flame. Allow the grill to heat. Keep a spray bottle handy – grill fires are common and can be dangerous if not monitored and stopped. Keep a spray bottle close by in case any flame arises. Never leave your grill unattended – the second most common cause of gas grill fires is leaving the equipment unattended according to the National Fire Protection Association.